Vented and Nonvented ends on the same combination evacuator. High quality plastic with no sharp edge..
Soft edges with fine finishing for greater patient comfort. Vented/Non-Vented, fits standard suction.. Available in 5 designer colors to match any office decor with Unique "S" tip design which elimates a..
High Volume Evacuator Tips Our High Volume Evacuator Tips have a vented and non-vented combination ..
Multi-colored HVE tips. Product Name Colored HVE Tips Manufacturer H.. 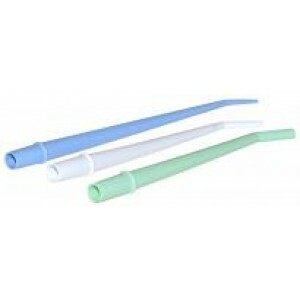 Oral Evacuator, Non-Vented Tip, Bendable.HVE Tips100/BgProduct NameOrajet TipsManufacturerPlasdent C..
Saliva Ejector Basket PlasticPk of 10Product NameSaliva Ejector Basket ScreenManufacturerDCI Interna..
Autoclavable Extended Vacuum Valve LeverEachProduct NameHi-Volume Evacuator ValvesManufacturerDCI In..
Autoclavable gray replacement lever.3/PkProduct NameSaliva Ejector LeverManufacturerHager Worldwide ..